Kem Arrow cards are special used in some certain games. They are popular for the unique material. The genuine Kem arrow cards are 100% Plastic-Cellulose Acetate, which is a strong, tough, yet flexible plastic. 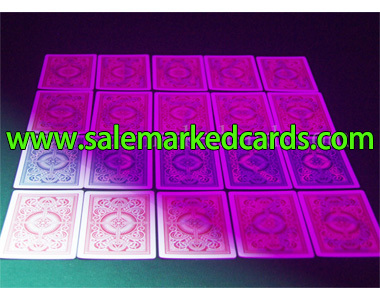 They are longer lasting than any other plastic playing cards available. These features make the KEM Arrow playing cards and marked cards very popular to the poker players. What's more, the material makes the KEM Arrow cards virtually impossible to mark or dent. However, our technicians spent lots of time trying many ways to mark the KEM Arrow cards. We try and fail and try again. Our experienced technicians do get a way to mark the invisible ink marks well. Though we need some time, we can make the best KEM Arrow marked cards! We can make any marks according to the customers' requirements, such as big marks without suits, special signs for suits and so on. And usually the KEM Arrow cards may be marked in the following way. KEM Arrow playing cards are in double decks of poker size. Usually red and blue, black and golden decks come together in one set. And the wide size KEM Arrow cards have jumbo index.